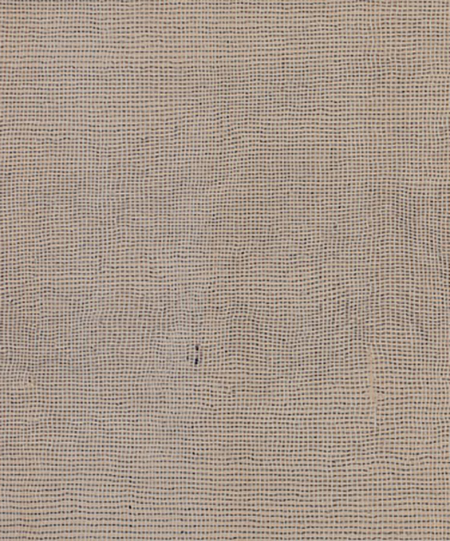 John Wilcox, "Shroud" (detail), 1990, acrylic on unstretched canvas, 72 1/2 x 192 1/2"
A thorough and compelling retrospective showcasing the work of late American artist John Wilcox (1955-2012) makes the case for his singular talent. Wilcox lived and worked in New York during the 80’s where he was initially diagnosed with HIV in 1989. He ultimately succumbed to the disease some twenty-three years later. During this time he witnessed first hand the loss of personal friends and artists from the art community in New York and Dallas, where he finally settled. His work during these years addressed a quite personal experience with aids through art works in various media. This exhibition includes over twenty paintings and dozens of works on paper, as well as notebooks, studio ephemera and tools used by the artist. Stylistically the work channels minimalism, hardedge art, pointillism, abstraction and conceptualist text pieces. One of the most moving works, “Shroud” (1990), was completed a year after Wilcox learned of his condition. This painting, in acrylic on unstretched canvas, is 192 inches in length and features an overall grid motif of vertical white lines over a web of horizontal blue lines that form the deepest layer. There are clear imperfections in the lines themselves as they meander across the surface in defiance of linear perfection. The title and its massive horizontality suggest the notion of a cenotaph, an empty tomb that will one day shroud the artist’s body. Like many works executed by Wilcox over the last two decades of his life, he permits himself an obsession with process and repetition via a time consuming and utterly meditative working method. Self-absorbed such works may be, but Wilcox beckons us to keep him company on his creative journey. One of these fascinating works is comprised of twelve panels in rows of four. Dots are laid over the surface without a hint of a grid. In “Paradise” (1989), Wilcox painted pale red and blue dots over the canvas, allowed the paint to dry, then sanded the surface, repeating the process several times. The dots become joined to the substrate canvas; rather than rising above it, they offer a subdued and tranquil aesthetic experience that summarizes the art of this major talent.